The Book of Tobias, as it is called in the Latin Vulgate Bible, is also known as the Book of Tobit. It is one of the most delightful books of Hebrew Scripture, the Old Testament of our Bible. The father is called Tobit – Τωβßτ in the Greek Septuagint and his son is named Tobias – Τωβßας. The book begins with Tobit, an Israelite of the Northern Kingdom who was deported to Nineveh, who suffers blindness. Sarah in Media suffers torment. Because of their good life and prayers, God sends the Archangel Raphael to help them. The virtuous young Tobias the Son joins the disguised Raphael on a journey to Media on his father’s behalf, and brings happiness both to his Father and Sarah. 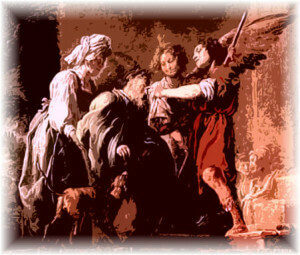 Archangel Raphael heals Tobit of blindness, he protects and guides Tobias on his travels and he delivers Sarah from an evil demon. Tobit, Tobias and Sarah were beset by trials and difficulties to purify them, but they remained steadfast in their faith during the period of testing, and eventually enjoyed God’s blessings and mercy. All prayed for deliverance and God sent St. Raphael. The longest recorded speech of an angel is the Archangel Raphael in Chapter 12. The message of the book is that God is both just and free. Suffering is not a punishment but a test. God in the long run does reward the just and punish the wicked. The believer is called upon to trust God and live his way. The book is rich in principle, and presents the sanctity of marriage, intercession through Angels, reward of good works, and parental respect, as well as the importance of prayer in our daily lives, fasting, and especially almsgiving in expiation of sin (12:9). Raphael reveals himself in a fascinating statement in Chapter 12, as “the angel Raphael, one of the seven who stand before the Lord” (12:15). Even though the setting takes place in the eighth century BC, it is thought the book was written after the time of Ezra, and thus it was not included in the shorter Hebrew Canon. However, the book was part of the Old Testament Greek Septuagint, and has always been considered inspired by both Catholic and Eastern Orthodox Churches. The recent discovery of the book with fragments in both Hebrew and Aramaic among the Dead Sea Scrolls in Cave IV of Qumran has given the book renewed attention.